Trunk-forming species 4-20' tall. Can sometimes form small clumps with branched trunks. 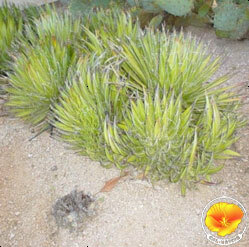 Probably one of the most drought tolerant of yuccas, requiring only intermittent watering even in most arid climates. Dense clusters of purple tinted white flowers in spring followed by fleshy green fruit. Native in Mojave & parts of Sonoran desert. Full sun. Needs good drainage. Tough gray green leaves with curling fibers on edges. Sharp point. Birds love seeds.